Window into Winter is a modern, geometric shawl design which takes inspiration from the stark lines, dark skies and glistening snows of the Swedish winters. However, it is just as a much a view out of winter, too: The contrasting border mimics the shape and colour of the winter aconite, a cheerful little yellow flower that is the first to appear after the long, cold months. Outside it's snowing again, but inside I cast my mind back to spring time in Japan: cherry blossoms and pretty colours. 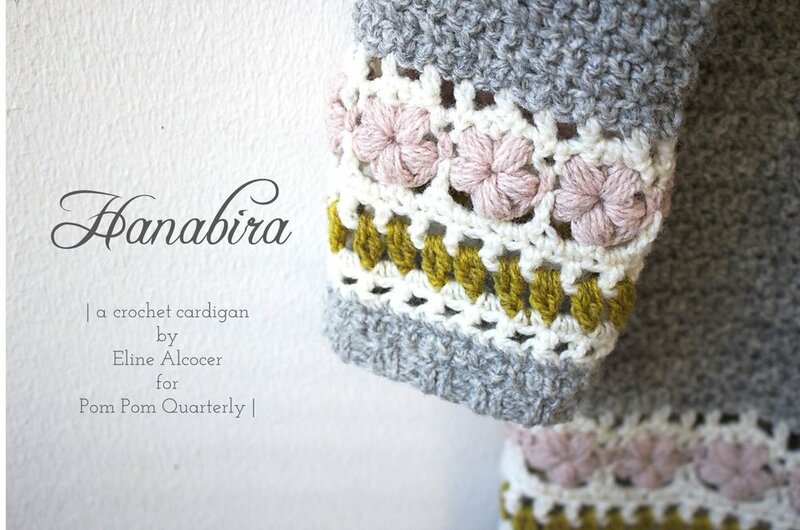 Introducing my latest pattern release, Hanabira, for Pom Pom Quarterly. This cheerful, warm hat pattern includes full written instructions as well as step-by-step photos of all the tricky bits. Make one, make two, make a set for the whole family! NEW PATTERN: These simple striped mittens are the perfect winter gift for little people. Three colour scheme suggestions, step-by-step photos of the trickier techniques (foundation crochet, changing colours, crochet ribbing), and a variation for a rounded tip are included in the pattern.